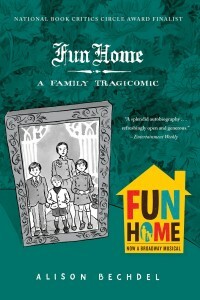 Alison Bechdel’s critically acclaimed memoir Fun Home: A Family Tragicomic will remain in the English curriculum at Watchung Hills Regional High School in New Jersey. The school board voted to keep the graphic novel 7 – 2, despite the calls for its removal by the community. Instead, the curriculum has been expanded to make Fun Home one of three choices for the students to pick in the LGBTQIA literature unit. The other two works are We Are Okay by Nina LaCour and Speak No Evil by Uzodinma Iweala. Back in May, Comic Book Legal Defense Fund in collaboration with National Coalition Against Censorship as part of the Kids Right to Read Project, sent a letter to Superintendent Elizabeth Jewett in support of the inclusion of Fun Home in the curriculum. Graphic novels combine visual art with literary and cinematic techniques for educationally rich storytelling. Alison Bechdel’s Fun Home is an essential text that has been recognized with significant literary awards. The book has been heralded within the literary and arts community as “a pioneering work” in the comics and memoir genres. (New York Times Sunday Book Review). The inspirational novel chronicles Bechdel’s real-life struggles of sexual identity, emotional abuse and domestic strife while growing up in rural Pennsylvania with a closeted gay father. Bechdel’s memoir is resonant with many youth experiences and offers teen readers a safe place to examine questions related to personal identity, family relationships, and the need to face the truth in their own lives. The full letter and as well as the CBLDF Discussion Guide that was included in the email to the Superintendent can be read here. Congratulations to Superintendent Jewett and the Watchung Hills School Board for their decision to protect students’ right to read, and to continue to offer an important graphic novel and work of LGBTQIA memoir, which in turn, broadens the voices and experiences found in their curriculum. The choice to add two more works that students can choose from, creates an abundance of choices instead of a restriction of reading, and should be applauded as a great way to handle opposition to assignments in the community. To grab a signed and sketched copy of Alison Bechdel’s memoir Fun Home: A Family Tragicomic, visit CBLDF’s Reward Zone and support the fight for students’ right to read!